The colors are a bit red-shifted, but you get the idea. A prismatic bat wing. I do confess that I would have had a little bit left over at the end had I finished off where the pattern said to stop – after point #8. But the color change in it was among the nicest in the ball, so I kept going, using every bit of the precious Zauberball Crazy, and finishing off with some leftover red sock yarn from my stash. I’m pleased with it, and as soon as it’s dry and I can darn in the ends, I’ll be rocketing it off to Elder Daughter. Unless she declines because she wants the fun of knitting her own. 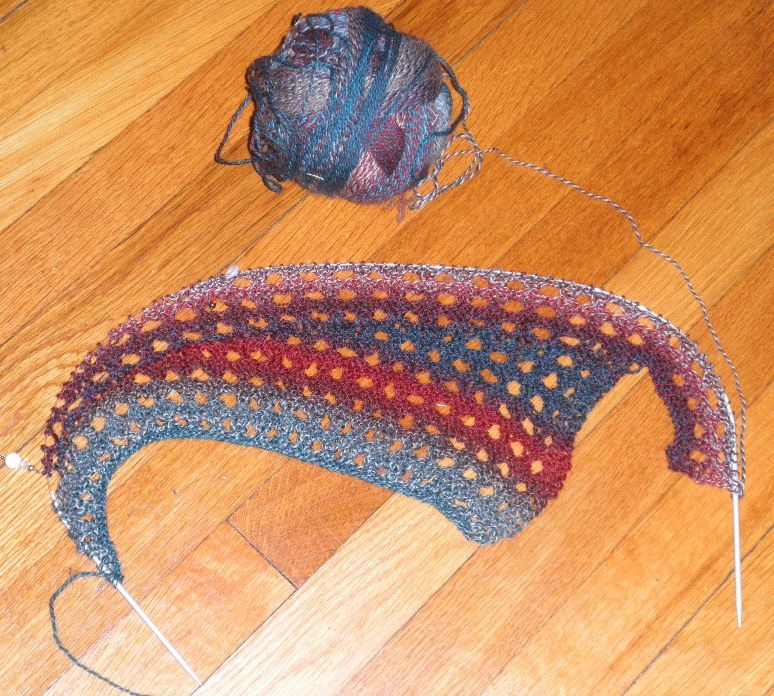 Wingspan #2 is now on the needles. Younger daughter requested the darker color ball. She also asked that her scarf be narrower, with lots more holes. So I’m playing with the concept. Instead of one row of eyelets to close out each point segment, I’m working eyelets every 6th row; and I’m making them larger by doing them as S2-K1-PSSO center double decreases, followed by double yarn overs. Some fudging is going on, all on the fly, to make a garter border around the growing point ends, and to fit the eyelet progression into the short row edge shaping. Just enough (in combo with watching the colors change) to keep my interest. In other news, we ran away for a bit of fun this weekend. 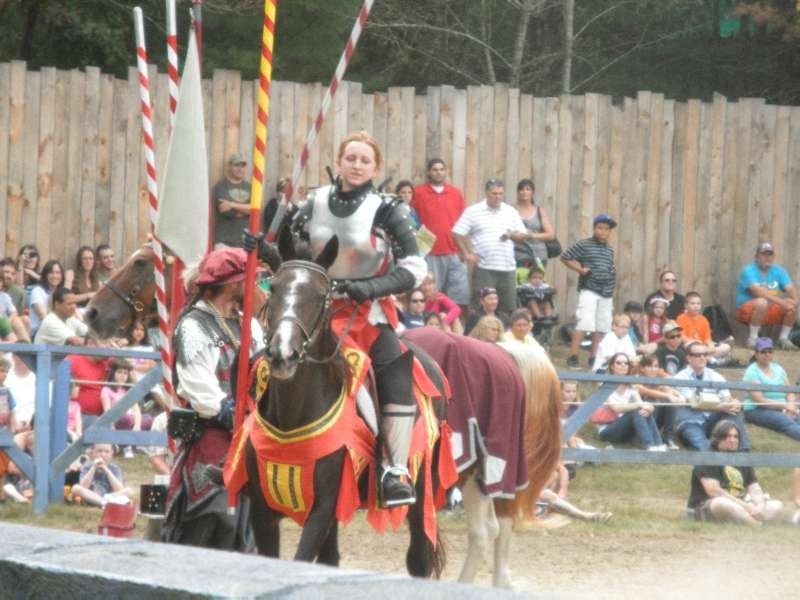 Younger Daughter, her pal and I went to King Richards’ Fair in Carver, MA – the local renfaire. The kids dressed up and had a great time, being new to small stage jugglers, acrobats, and general comedic banter. I will say that I was less impressed. For all of the staff’s efforts, the charm of the thing is largely gone when compared to my memories of eight or so years ago. There was only one artisan working in the compound – a fellow doing lamp work glass. I missed seeing more of that – the leatherworkers, the folk at the forge, and the like. 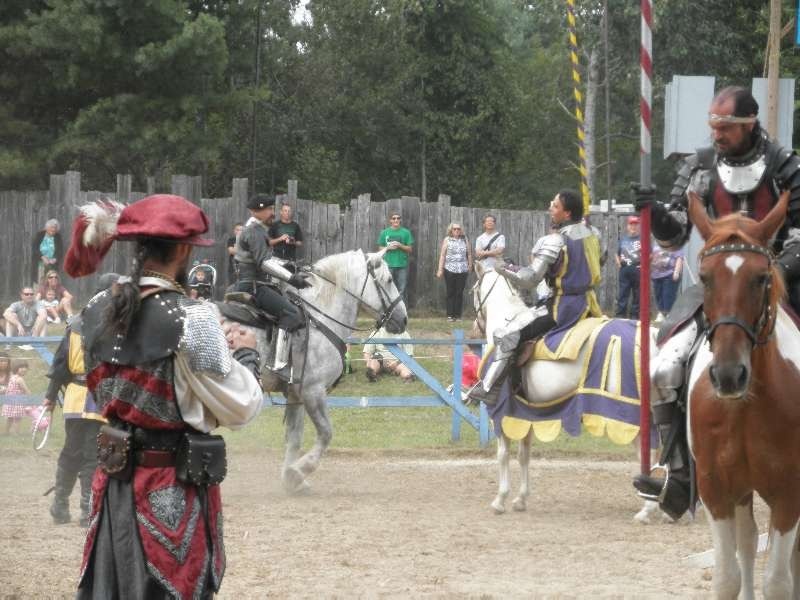 The mounted “jousts” were the only things there that were free. Younger daughter was camera wrangler, so it’s no surprise that our pix are all of the horses. The show we saw started with tilts at target and rings, and ended with lance to lance on horseback. It was highly staged (which we didn’t mind, given the risk of injury if the combat were more real), and fun to watch. From the start, I was mildly miffed. Although I brought cash with me, I was annoyed that in none of their ads or websites anywhere is the fact that the faire is cash-only listed. I heard more than one attendee retreat from the ticket window, to drive back to town to find a bank rather than use the exorbitant fee ATM machine at the gate. Once you’ve paid your $27 per person, inside the faire you’ll find that everything costs money. Food is on a ticket system, sold in $5.00 blocks of tickets only. They’re 50 cents each, although (again) this isn’t posted anywhere. A bottle of water is seven tickets ($3.50), a child’s plate of chicken fingers and fries is 17 tickets ($8.50), a sausage on a roll is 19 ($9.50). And the prices of foodstuffs are arranged so that it’s difficult to not have a few tickets left over that you can’t redeem. I saw one guy hassled by staff when he tried to sell his leftover four tickets to another visitor. All rides, attractions, or other events (again except for the horse-related arena stuff) come with an additional fee. $2.00 for the maze. $4.00 for archery, $3.00 for a kiddie ride, and so on. It would be easy to go with two kids and without eating a thing, spend $100 on top of admission just in an hour of walking around. It’s clear that even the small stage performers are largely paid by passing the hat. They did deliver amusing, well rehearsed performances that we did enjoy. I did feel sorry for them and pony up, but again – you’re opening your wallet for everything other than breathing. I was also disappointed at the large number of adults who seemed to be there in order to drink while walking around. 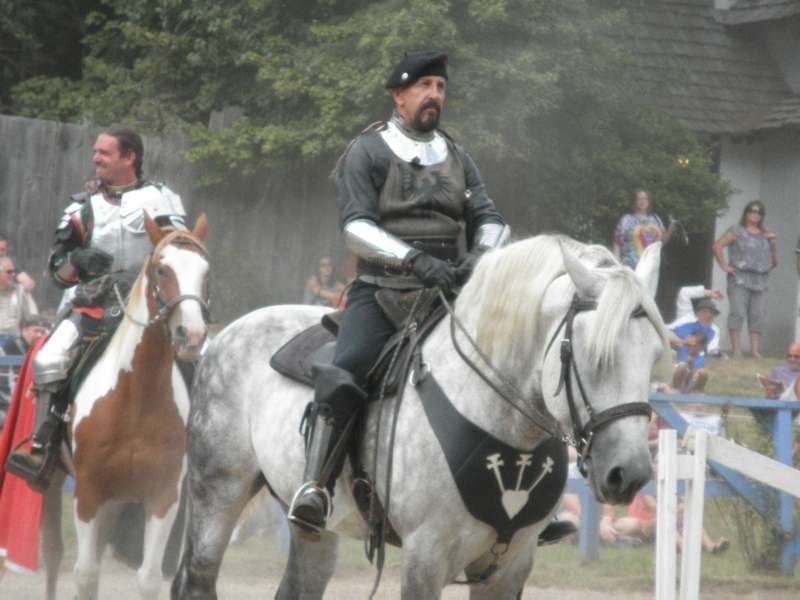 This was a holiday weekend, and the Faire’s opening weekend. I expected to see more renfest geek kids – herds of teens in costume; and families with children over stroller age (strollers are difficult to push on the uneven ground). But about three quarters of the crowd were adults in their late 20s through 30s, wandering around in advanced states of tipsy. Not what I expected. On the merchants – based on the prices, I assume that the Faire charges steep rents for those kiosks and stalls. What I saw was very pricey. Lots of stuff catering to folk dressing for the next renfest, of course, which I did expect. $75. light cotton elastic waist skirts I could make out of a remnant for under $5.00. $300 wench bodices. $150 capes. $100 pewter cups. $75 leather notebook covers. There was some jewelry and toys in the $15-30 range, but you had to hunt for it. Again, I will say that the kids had fun. I did too in spite of being annoyed, and for that I thank the individual small-stage performers. They made the day. But the Faire as a whole has gotten more expensive and cheesier than I remember. We won’t be going again. I do admit that I have been to a large faire here in Texas and I totally agree, it is cheesy and expensive, overpriced for what is offered. The one thing I saw that was pretty neat was a cloak covered in peacock feathers which was stunning. Each feather was individually bound to the cloak to cover it. I have found that I much prefer the SCA events, and they tend to be much more entertaining. 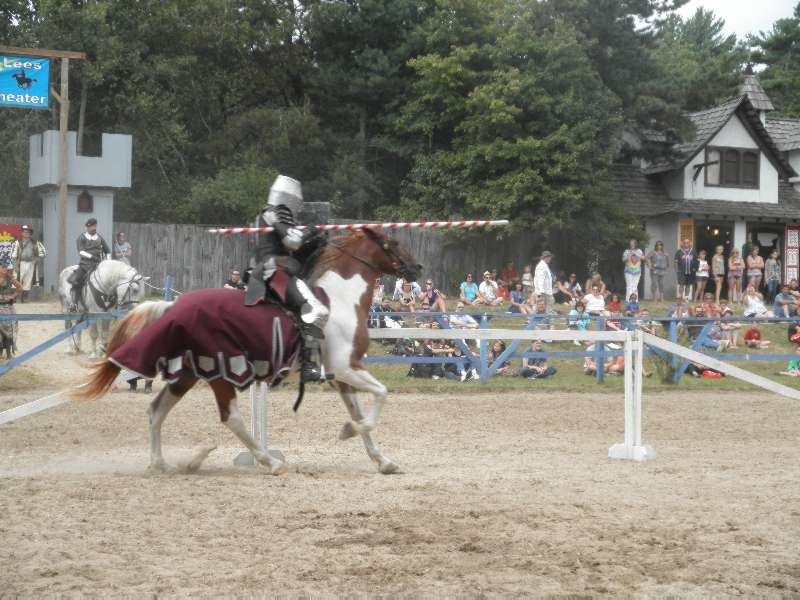 Then again, how can you compare full contact jousting vrs rehersed jousting….. I can also say that alcohol was definately a focus of what was sold and there were many many people walking around semi drunk. The females walking around in chain maile bikini’s were kinda odd too, lol.